Ok, so maybe I celebrated Valentine’s Day twice this year, kind of compensating for the last years 😉 No, joking. Although I had made like tons of Valentine’s Day Cookies I suddenly though hmmm but what about dessert? Cookies for dessert could work no question about that. But I wanted something more… Cake! Red Cake. Red Velvet Cake! An idea was born. I already did some Red Velvet Cupcakes last year, from one of my favorite cooking books by Nigella Lawson (whom I absolutely adore). However, I felt it was time for a new approach, my own approach. Mostly because I just didn’t really like the red food coloring, too artificial. I wanted to get back to the roots of Red Velvet Cake, which literally let me to Beetroots 😛 So I came up with this little recipe, which is really super moist thanks to the beetroot and some Greek Yogurt. Maybe it could have a little more chocolate in it, but as a whole it is a pretty nice cake. It almost reminds me of a really rich, soft, moist and dense brownie, really. But than with the freshness of yogurt and the savory of beetroots. 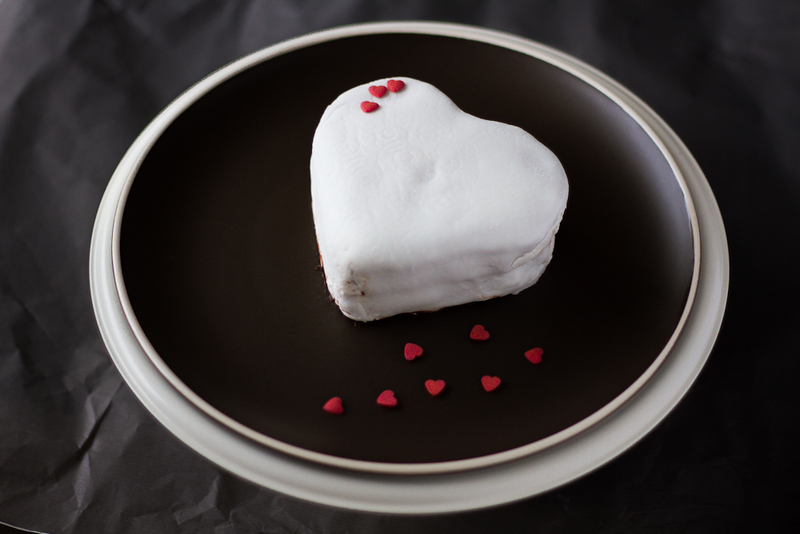 Obviously I made a heart shaped cake as I am not already surrounded by enough heart-shaped food already… During the process I suddenly though about my left-over white fondant which I have used for my Winter Cupcake Snowflakes and my new embossing mats I recently got myself 😉 So, happily I could try many new things in one cake again! I want to share it with you anyway, as the recipe itself really is delicious, and if you wish you could add a little more cacao to it to get just more bitterness and depth. As there was already some Greek Yogurt inside the cake, I also wanted to cover it with it, so I made a Greek Yogurt Frosting. Saying that, here comes the next bump, as this also wasn’t perfect 😛 Sorry to disappoint you… It is a good tasting frosting, don’t get me wrong, but it was just a bit too runny for this cake. 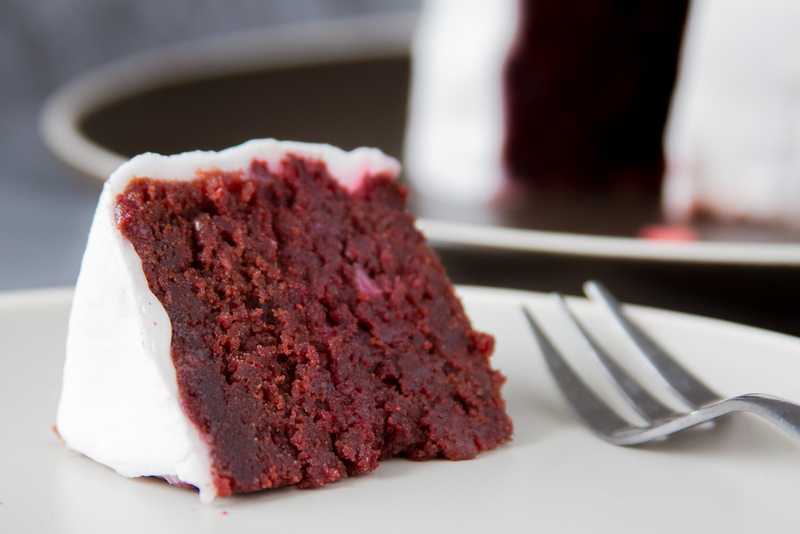 I guess there is a reason why everybody makes cream-cheese frosting along with Red Velvet Cake after all… I assume Greek Yogurt Frosting would be just perfect to go on top of cupcakes, so that’s why I will share this recipe anyway. 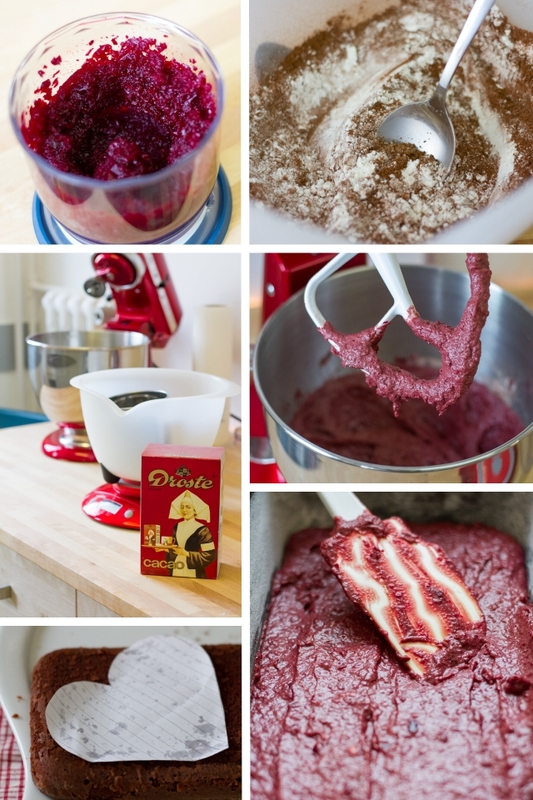 I will definitely try it once more with Cupcakes (maybe Blueberry, hmmm). I guess that was all the bad news I had to say, let’s get to the recipe of this really good and moist cake. I bought some pre-boiled beetroot and chopped it finely in my food processor. Cream the butter with the Greek Yogurt, than add the sugar and mix until light and fluffy. Beat in 2 eggs, one at a time and mix thoroughly between each addition. Add some Vanilla. Mix in the chopped Beetroot. Bake in a pre-heated oven for 25-30 minutes at 180°C (or 160°C in a fan oven). Just a brief word of attention: The mixture looked a bit lumpy for me, but after adding the dry ingredients it looked smooth and well combined and the cake in the end baked evenly and well. But make sure that all your ingredients are at room temperature, especially the eggs and mix well between each step to avoid a “lumpy” looking batter. 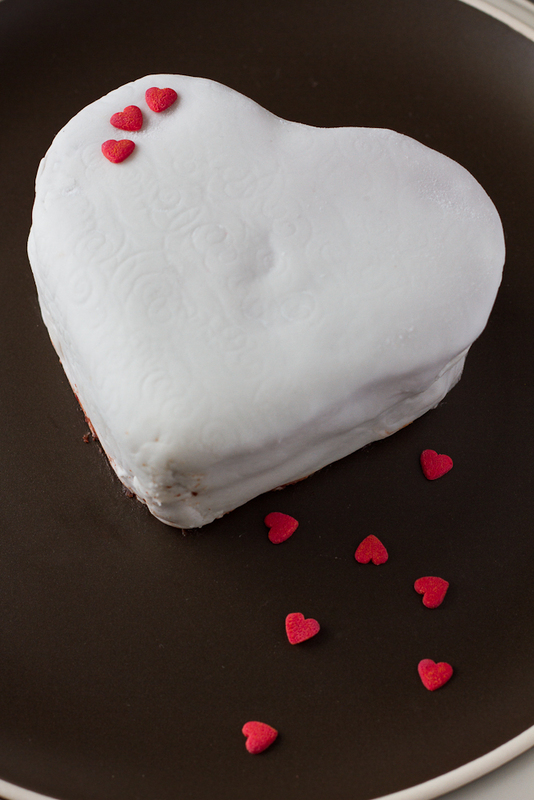 Mix 100g of Yogurt with 60g sifted Icing Sugar. Add 1 Tsp of Vanilla and mix well. Cool everything for at least half an hour, as it will help to thicken the frosting. 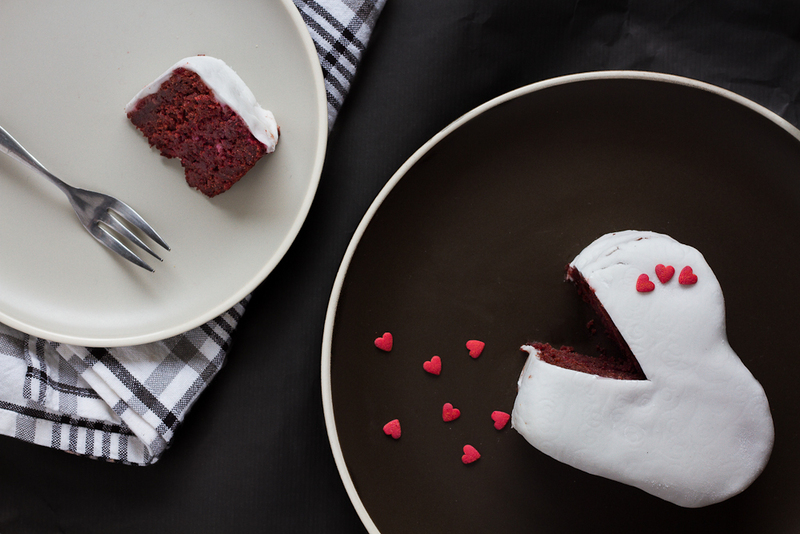 My Beetroot Red Velvet Heart was featured at the Sugar and Slice Sunday Link Party. Thanks a lot Lisa! Well done! 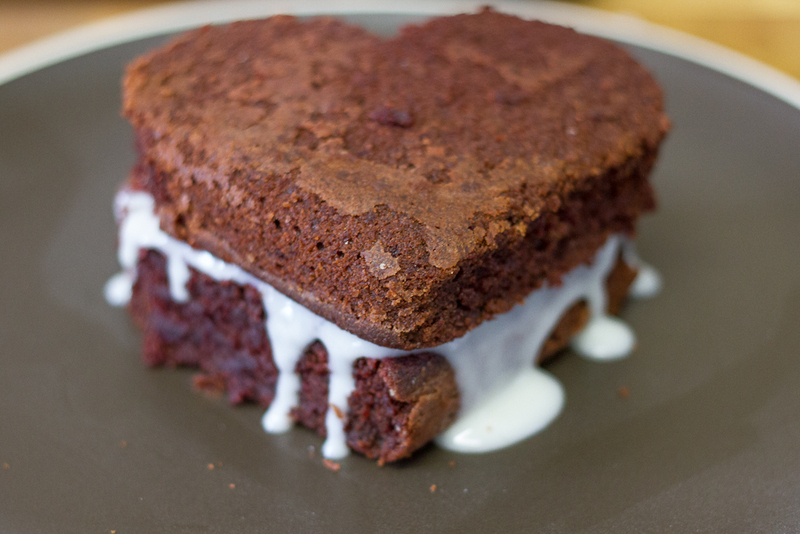 Everyone loves red velvet, but the amount of food coloring used is insane! Hope you can stop by my enchanted oven and say hi! Thanks a lot 🙂 Seeing what amazing creations you have on your blog, this really is a huge compliment for me 🙂 Thanks so much! So beautiful Rebecca. By the way I got your email, I’m not ignoring you but time management has seriously got away with me this week. I’ll get back to you ASAP. Also, I’m featuring you tonight on Sugar & Slice Sunday. Thanks for linking up. I hope you’ll submit more this week. Beautiful, healthy, and delicious?! You are a genius! Great recipe!